The pre-front and cold front came through as predicted but nothing like the blizzard the states had so we heard. The winds were strong all day Sunday and it was a good day for me to do some scrap-booking while Al worked on our one toilet that wasn’t working quite right. Thank heavens we have two heads on board! As night fell the winds keep getting stronger and they were as high as 39 knots at one point which qualifies as gale force winds. Luckily all the boats around us had been here for at least two days so the anchors were secured and no major problems occurred. The winds blew 25- 30 knots all day Monday so again, not a day to go ashore. We did a lot of reading and organizing due to the fact we wanted to get our snorkel gear out which was way back in the quarter berth where we store our folding bikes and everything that we don’t know where else to put it.Our hope is that it will warm up so we can get some snorkeling in. Today, Tuesday, the winds lessened to 12-15 knots so we decided to move back near Staniel Cay so we are there for their festivities coming up for New Years. They have regatta races, an auction, happy hours, special meals and a pirates party to name a few of the activities. We hope to join in on some and be spectators for others. Have a Happy New Year. The last blog entry was entitled Paradise Found but we should have named it Man-made Paradise Found because of the resort Atlantis. Now we have found the true paradise of the natural sort. The waters have so many shades of teal and blue that they are just amazing! From Nassau we had a great sail to Norman Key and then the next day to Warderick Wells Land and Sea Park. It took my breath away when we arrived at Warderick Wells. It was just so beautiful. 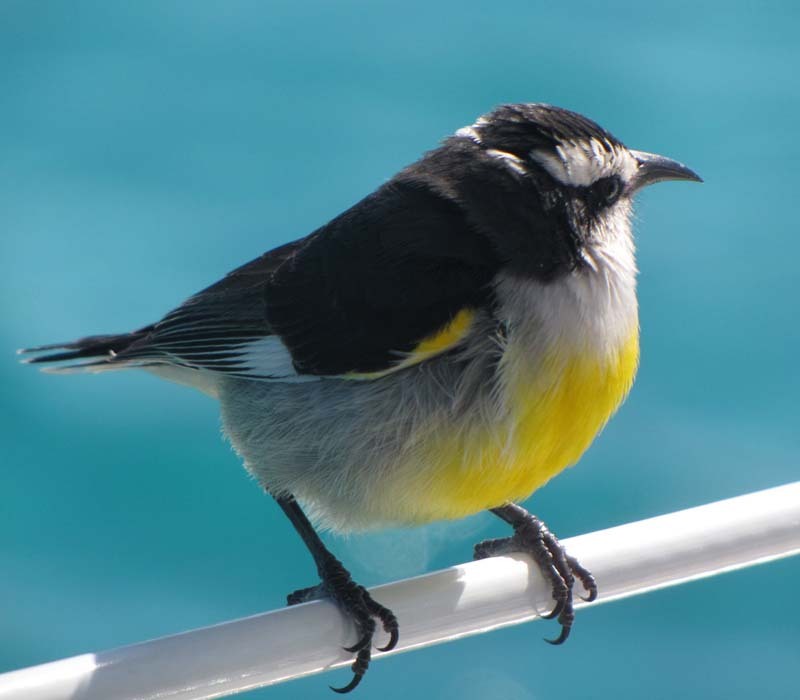 While we were tying to the mooring the prettiest bird called a Banana Quip greeted us on our life lines which seemed like a good omen. We used our “looky bucket” (a bucket with a plexiglass see-through bottom) to see some of the marine life on a coral reef nearby and then hiked the island with Dave and Toni. At the highest point on Boo Boo Hill we had a spectacular view of the harbor where Blue Heaven was located and the deep blue ocean on the other side of the island. The next day we had a motor sail to Big Majors Spot. However, the wind was not as far north as we hoped so had a roly-poly night and decided to move north to Pipe Creek because a front would be coming through on Sunday out of the west with wind predictions of 25 to 30 k. Time to find a protected spot! Pipe Creek is another wonderful spot. So wonderful, quite a few boats come and stay here all winter. At 3pm we had a beach party at the designated “Yacht Club”(a few signs and various nautical items left by past cruisers) complete with good food and Christmas carols with accompaniment by a guitar and a recorder.. It was a great way to meet all the people on the boats in the anchorage and get into the Christmas spirit..
Christmas Eve day I baked all morning getting ready for our dinner on Blue Heaven with the Englers and Mershons. After lunch we hiked to the ocean side looking for shells and sea glass. Toni, the experienced one, found two beautiful shells. I have to open my eyes more! We had a wonderful ham dinner complete with all the fixings. We are so blessed to have such good friends with us when we are so far from home. It makes it easier being away from family. Christmas morning people came by dinghy bearing a lot of home-made goodies. There is such camaraderie and caring among the cruisers. A lot of us headed to Sampson Cay marina by dinghy for Christmas dinner. We had a wonderful meal of Rosemary chicken with gravy, garlic mashed potatoes, sautéed peas, berry cheesecake and coffee. When we first entered they had out fresh strawberries, raspberries, chocolate dipping sauce and fresh home-made doughnuts for which they are known. Everything was delicious and as usual a good time was had by all! Sorry we have no pictures because they are beautiful but the WIFI here is so slow we cannot upload them. 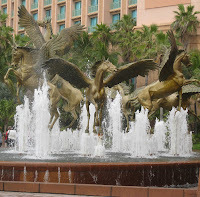 The last blog entry was entitled Paradise Found but we should have named it Man-made Paradise Found because of the resort Atlantis. Now we have found the true paradise of the natural sort. The waters have so many shades of teal and blue that they are just amazing! From Nassau we had a great sail to Norman Key and then the next day to Warderick Wells Land and Sea Park. It took my breath away when we arrived at Warderick Wells. It was just so beautiful. While we were tying to the mooring the prettiest bird called a Banana Quip greeted us on our life lines which seemed like a good omen. We used our “looky bucket” (a bucket with a plexiglass see-through bottom) to see some of the marine life on a coral reef nearby and then hiked the island with Dave and Toni. At the highest point on Boo Boo Hill we had a spectacular view of the harbor where Blue Heaven was located and the deep blue ocean on the other side of the island. The next day we had a motor sail to Big Majors Spot. However, the wind was not as far north as we hoped so had a roly-poly night and decided to move north to Pipe Creek because a front would be coming through on Sunday out of the west with wind predictions of 25 to 30 k. Time to find a protected spot! Pipe Creek is another wonderful spot. So wonderful, quite a few boats come and stay here all winter. At 3pm we had a beach party at the designated “Yacht Club”(a few signs and various nautical items left by past cruisers) complete with good food and Christmas carols with accompaniment by a guitar and a recorder.. 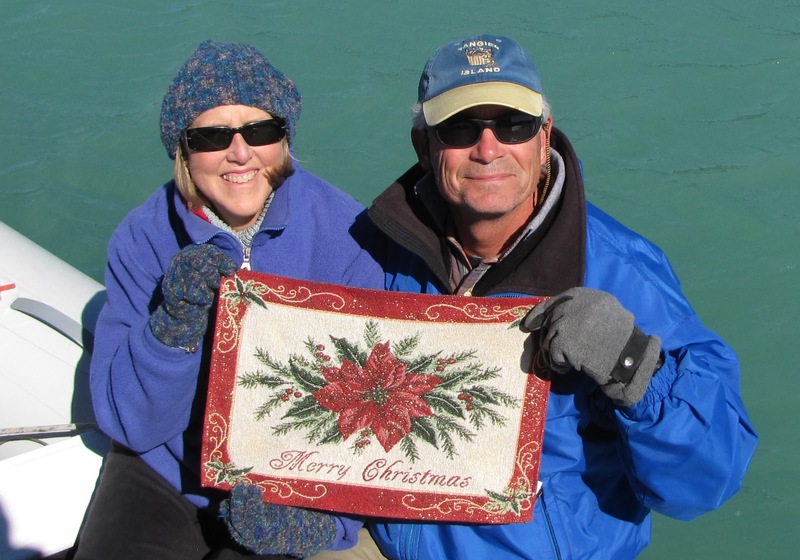 It was a great way to meet all the people on the boats in the anchorage and get into the Christmas spirit..
Christmas Eve day I baked all morning getting ready for our dinner on Blue Heaven with the Englers and Mershons. After lunch we hiked to the ocean side looking for shells and sea glass. Toni, the experienced one, found two beautiful shells. I have to open my eyes more! We had a wonderful ham dinner complete with all the fixings. We are so blessed to have such good friends with us when we are so far from home. It makes it easier being away from family. Christmas morning people came by dinghy bearing a lot of home-made goodies. There is such camaraderie and caring among the cruisers. A lot of us headed to Sampson Cay marina by dinghy for Christmas dinner. We had a wonderful meal of Rosemary chicken with gravy, garlic mashed potatoes, sautéed peas, berry cheesecake and coffee. When we first entered they had out fresh strawberries, raspberries, chocolate dipping sauce and fresh home-made doughnuts for which they are known. Everything was delicious and as usual a good time was had by all! ﻿ Just a brief addition to tell you we made it to the Bahamas. Yeah! The wind was directly on our nose the entire trip so it was a very “loooong” motor. We were so glad when we could finally shut the engine down. We made it from Miami to Nassau in twenty-eight hours which according to experienced cruising friends was good time. It was a little lumpy in the Gulf Stream but not too bad, and the entire trip across the Bahama Banks and even down through what they call the “Tongue of the Ocean” was quite smooth. We cleared customs and immigration but were granted only a ninety day cruising permit. We were hoping for twice that, but they assured us that if we go to the customs office the week of expiration that we will be granted another ninety days. It just makes more work for themselves and makes us cruisers have to move to an island that has an office. Oh well, that is just the way it is in the Bahamas. ﻿﻿﻿ We are in a marina to do laundry, replenish fuel and wash off the salt encrusted boat. Today we played a little by visiting the Atlantis Resort on Paradise Island. Wow, talk about opulence. It is beautiful and just reeks of wealth. You all need to take a vacation there. It really is quite nice! Maybe next time we will stay at their marina and really live it up! ﻿ Tomorrow we will leave Nassau and head south toward the Exumas, hopefully, to spend Christmas at Staniel Cay before reaching the fabled Georgetown (aka. Retirees Day Camp). Goodbye Miami, Hopefully Hello Bahamas! The time has come! We plan to be out of this anchorage at 3am to leave for crossing over to the Bahamas on tomorrow (Thursday) and continuing straight through to Nassau hoping to be there around 8am on Friday. We have dealt with some serious cold this week with night time temps down to 37 degrees and highs only in the fifties. That is cold when you are on a boat on the water with wind gusts up to 32 knots! And that is in a totally enclosed harbor! The wind quieted down today so the ocean should be fairly calm. So calm in fact that we will probably have to motor due to no wind prediction. Better that than too much wind! Since we have no idea how much we will be able to get wifi this might be the last blog entry for a while. We hope to get into a marina in Nassau but with approximately 50 boats crossing tomorrow there might not be any " room at the inn." If not a blog entry, I might send a brief email saying we made it so all you "worry warts" don't have to worry about us over the Christmas holidays. Speaking of Christmas, we wish you a very Merry Christmas and Happy New Year. We wore our winter clothes so you would not feel so bad! I wish that was the only reason. ﻿﻿﻿﻿﻿﻿﻿﻿﻿Our group moved yesterday for a change of scenery to the Key Biscayne area. We wanted to go into No Name Harbor but there were 19 boats in there and would not take four more. So we went around the corner to Hurricane Hole which worked well except for the birds bombing us in the morning with their blue splats all over our deck and white bimini and sail cover! I guess I will be putting my cleaning skills to the test. It started to warm up but our group of boats waiting to cross, hesitated on going (Saturday) because it was only a short weather window followed by a very strong cold front to come in Sunday night. The winds are still out of the north although lighter (10 knots) but we were taught that you don’t want north winds crossing the Gulf Stream which flows north because it can be very uncomfortable. Also the cold front will have winds of 25 -30 knots and we don’t want to have to stay put for several days in Nassau where thievery is common. The next good crossing is predicted around Thursday and looks good for several days after. If only that could be written in stone! Dave Mershon and I kayaked the anchorage hoping to find a way to get to some of the canals in the area but unfortunately discovered it land locked. Don and Sue decided to move and checked out No Name Harbor and were pleasantly surprised to find only five boats in there. That means that fourteen must have decided to try for the short weather window. Al and I decided to pull up anchor and motored over and got a spot near Don and Sue. The Mershon’s decided to stay put in Hurricane Hole and use their dinghy to motor over. The group checking out history of Stiltsville. Hello Miami! Time for a Road Trip. We safely made the trip from Fort Lauderdale to Miami sailing half the time in a fairly quiet ocean. The wind actually wasn’t quite strong enough to move us at the pace we like to go when trying to make miles, so we sailed with the motor the second half of the trip. Arriving in Miami definitely gave us a variety of things to look at which we have not seen else where. We made it to the anchorage by 2pm where our friends on Sequence and Jubilee were located between San Marino and Di Lito Islands near South Beach. ﻿ Later in the day they had a welcoming happy hour on Don and Sue Engler’s boat, Jubilee. It was a lot of fun meeting the other couples on boats in the anchorage who are all waiting to cross over to the Bahamas as well. Englers and we are the only “newbies” being our first time. One couple has done this fifteen times and most of the rest have done it three or more times. Some said they have waited as long as 3-4 weeks for a weather window. I hope it isn’t that long for us but it is not looking too good at this time. On Sunday Al took Sue and I to the dock in South Beach where we caught a bus to church. The bus cost all of $.25 a ride which is great for getting around town. Before going back to the boat we stopped at the local Publix to get a few more things and could not resist some free greens next to the Christmas Trees. Back on the boat I decorated for the holidays while Al worked on doing navigational "stuff" for the Bahamas or maybe he is praying for a weather window! Who knows??? Later the Mershons and Englers came over to discuss how we might get to Fairchild Tropical Botanic Gardens in Coral Gables to pass the time while waiting for good weather. We talked about moving the boats to the mooring off Dinner Key Marina in Coconut Grove and taking bus transportation, but finally decided on leaving the boats here and renting a car to get the six of us there. ﻿﻿﻿﻿﻿﻿﻿﻿﻿It took some time to figure out all the logistics but we did it and it was well worth it. We spent the day touring the gardens and looking for the wild life. We started the day with a tram ride to give us an overall view of the 83 acres that is included and to learn about many of the tropical plants there. One fact we learned was that there are 2700 species of palms. And I thought there were only a dozen or so! Being so chilly in the high fifties, we were afraid we would not see any butterflies but after lunch in the warmth of the sun they came out of hiding. Not quite so true for the birds but we enjoyed the magnificent gardens with all the various sculptures, flowers, insects and cacti. It also felt great to just walk most of the day on solid land instead of sitting and moving on the boat. All agreed it was a great road trip! Hope you enjoy the photos of what we saw. Don't miss the two bugs kissing! ﻿ Up early and off the anchor we went, headed for Lake Worth. Al wanted to get in early because we had the appointment at Customs and Border Protection (CBP). We motored the ICW and got through the bridges even with one having a span just ¾ of the way up. We anchored at the southern end of Lake Worth so we could take the dinghy into Riviera Beach Marina to dock and go for our appointment which was only about a block away. We had all the right documents for them so things went smoothly so now we are the owners of our own local boaters cards which allow us to just call in at any port we enter in the United States on our boat instead of having to physically present ourselves at the office. Afterwards we strolled the docks at Riviera Beach and I had my picture taken with the local celebrity. I think I have a real catch with Al, compared to this captain! 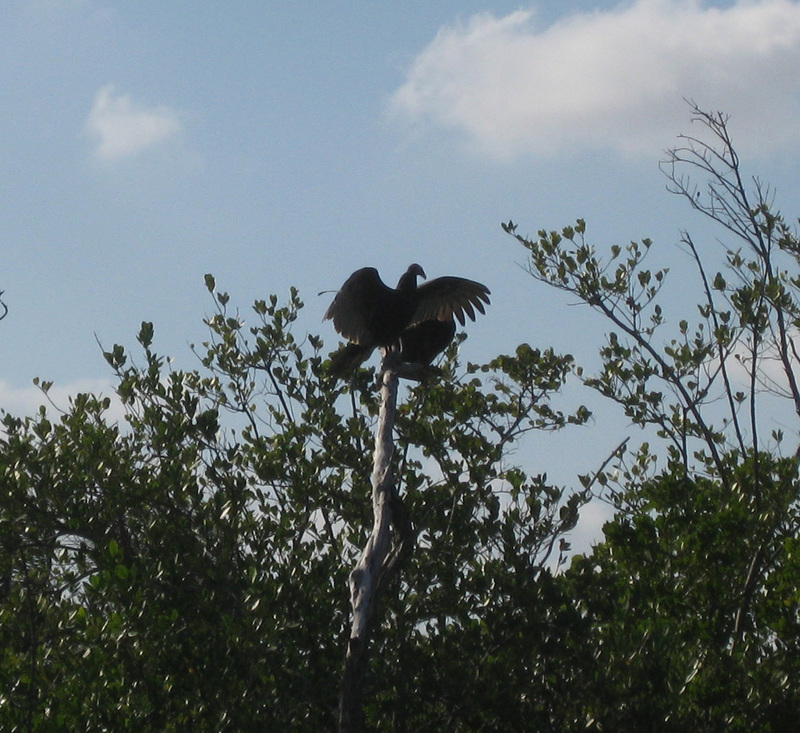 Turkey Vulture drying its wings. 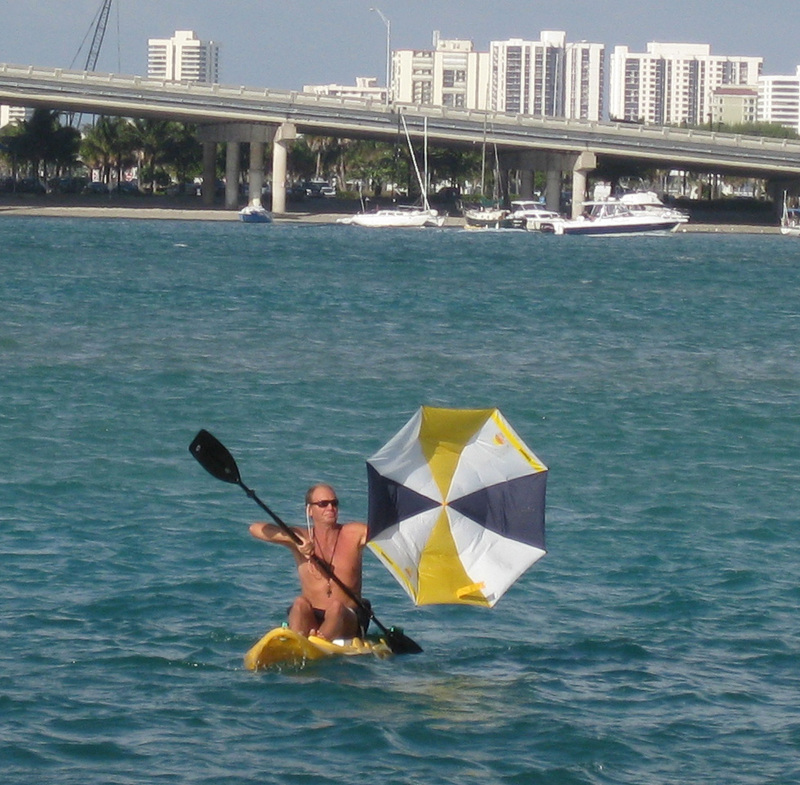 A new way of kayaking! It was blowing quite hard out of the north so it was a bit rough in the anchorage but luckily quieted down for sleeping. Our friends the Mershons called and said not to be in a rush to get to Miami to meet them because the weather window for this weekend for crossing has gotten too short. Also, strong winds for the days after arriving would trap us in Nassau where we planned to check in. From experience they said you want to get in and get out due to a lot of thievery in the area, so now it might be another week until a possible weather window opens. Al with his early Christmas present. ﻿We listened to the weather and Chris Parker who is the cruiser’s guru for predicting wind and wave conditions before we left Lake Worth. We decided at the last minute that it would be okay to go outside from Lake Worth to Fort Lauderdale so we could avoid over twenty bridge openings. 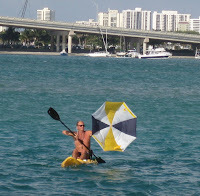 The wind wasn’t very strong but the waves were a little “roly poly” so we motor sailed the entire day to Fort Lauderdale. Al pulled out his new rod and reel to do some fishing but lets just say I am glad I had something thawed for dinner! As we came up through the Fort Lauderdale area, the opulence is unbelievable. The one house had not one, but two huge yachts at its dock! We got in to the anchorage called Lake Sylvia about 4 pm to see about fifteen boats already anchored in this small area. We snuck in and about five or six other boats came in after us! It is amazing how you can make room when you have too. We plan to go out in the ocean again tomorrow to reach Miami and meet up with Sequence and Jubilee. It looks like we will have plenty of time to explore South Beach and Miami before crossing to the Bahamas. Ten days at home seemed like a whirlwind! 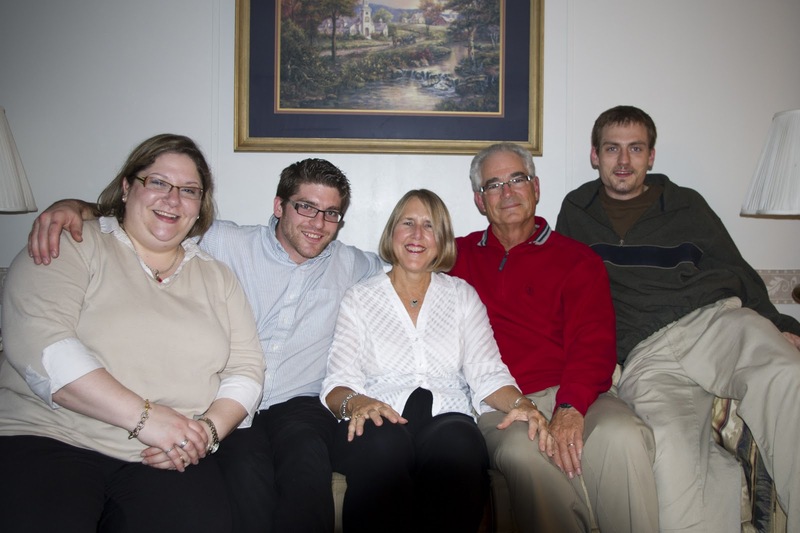 A visit to Al’s parents was a must and visiting with friends and prepaying bills was all we seemed to get done. My sister held the usual delicious Thanksgiving feast in Baltimore and getting caught up on all the news from our sons and relatives was accomplished. Flying back to Stuart from BWI was a bit more taxing than flying from West Palm Beach. The check in line seemed to wind around the entire airport even though they were doing just a few “pat downs” or scans. Al’s bag got pulled out for a special check. I knew those oil filters for the engine would probably get questioned! They were looked at thoroughly and then we were allowed to pass on to our boarding gate. Al getting the boat ready to leave. Back on the boat once again we went to the grocery store three times to shop. You can only carry so much in the bikes baskets and backpacks! Al got all the packages for more equipment that he ordered and so worked on various projects the last two days. We fueled up, pumped out the waste tanks and were ready to go. Being well stocked we headed to Peck Lake where our entertainment for the afternoon was watching a power boat run aground and have to be pulled off by Towboat US. Tomorrow we plan to go to the customs office in Riviera Beach for our interview for the “local boater’s option.” That way when we return from the Bahamas in the spring, we will only have to call in and not have to present ourselves physically at an office. We hope the weather will cooperate and allow us to sail outside down to Miami to catch up with our friends on Sequence and Jubilee. There is a possibility of a weather window to cross over to the Bahamas on Sunday and Monday. All we can do is wait and see. One last thing, it feels great to be out of daytime temperatures in the forties and back to beautiful sunsets and warmth although it is going into the forties tonight! The view of the bridge from our boat at nigh in Stuart. We made it to Stuart where Loggerhead Marina will be home to Blue Heaven for the next three weeks. It was The Harborage two years ago where we spent two months. Since being in Stuart we have been prepping the boat for the crossing to the Bahamas. Al received a new (used) single side band radio which he installed, changed the oil in the engine and thoroughly scrubbed the waterline and salt encrusted sides of the boat. I went for more staples and packed them away as best as I could. We did spend an afternoon with Al’s Aunt B.J. and cousin Leslie having a great lunch at Sailor’s Return the restaurant across the river in the new Sunset Marina which used to be the municipal marina. It was nice catching each other up on our lives and travel. We also met Al's fraternity brother and wife for dinner another night in Stuart so it was not all work and no play this week! I asked a woman on a boat if the marina had a courtesy car. I was hoping that had been added with the change of management. She said no, but offered to take us wherever we needed to go. So stops at a tackle store for lures, K-mart for various items, Lowes and of course West Marine. She said she has cruised and people took her around when needed so she was just passing the favor on. We are very thankful to Michelle because it would have been at least a twelve mile bike ride. We are not used to that! We were up early and off the mooring in Cocoa following Sequence to Vero Beach. It was a non-event sail and motor to the harbor except when a pair of dolphins played next to our cockpit for a short time. There was another boat from our sailing association, Jubilee, already on a mooring ball in Vero which we had hoped to share, but they were in town when we arrived so we went to an empty one instead. The wind had kicked up a bit in the afternoon so it took us three tries to finally tie up to Sequence on the mooring ball. You would have thought we were new at this and not thirty some years of sailing experience! ﻿ The next day we were up and on the 9am free bus to various stores along with many other cruisers to get the supplies we need for going to the Bahamas. Al and I each got wet suit shirts to go with our farmer John wet suit pants that we have. They say you need the suits to stay warm in the cool water for snorkeling. Al also bought a spear so that he can catch lobster and perhaps a fish or two. (This shall be interesting!!!! Maybe I should get him a loin cloth and a chimp so that I have my own Tarzan!) Next we went to the ABC Beverage store for wine and liquor and to the grocery store for food. Do you know how much a five month supply of that stuff weighs? We were on a bus, each with a back pack and what ever we could carry in our arms. We bought half of what we wanted and came back after lunch for another load. I will still need to shop for more items in Stuart next week and get fresh things after we come back from going home for Thanksgiving. After dinner we went to Jubilee to play dominoes, but they never even came out of the box. Don and Sue and ourselves just kept asking Dave and Toni lots of questions about the Bahamas and they were happy to share the information. ﻿Saturday we were on the bus again and out to Walmart for more needed items. Vero Beach businesses truly benefit from us cruisers. No wonder they provide free bus service! That evening called for a drink on Blue Heaven and then a walk in town for a fun dinner at Waldo's. ﻿﻿ Al spent Sunday doing projects on the boat. Up the mast he went to replace a light bulb and put up the radar reflector. I unfortunately caught a cold. The first one I have had in two years and I get it in Florida! I was wiped out so I just lay around and read. A dolphin played near by which as always was fun to watch. Once again the three couples gathered this time on Sequence to discuss the world problems and upcoming places we will be visiting. ﻿ We parted ways from Sequence and Jubilee today because we are headed to Loggerhead Marina in Stuart and they to Peck Lake. The marina is the same one we spent two months at on the last trip. We are flying home Friday and will be back Nov. 29th. We hope to do our fresh food provisioning and then zoom to Miami to hopefully catch up with Sequence and Jubilee. However, we told them if they have a great weather window, not to wait for us. We would find someone with whom to cross over to the Bahamas, We will not go alone! We declared Monday, Nov.8th “Bird Day”, the reason being that we saw more birds and variety of birds on this day than any other on the trip. Shortly after leaving Daytona we passed an island called Pelican Island and it was full of them. Not far from them was a white egret rookery. 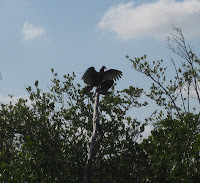 While motoring through Haulover Canal later in the day we saw several types of herons looking for their next meal. Then we passed a spoonbill pelican rookery. They are pink and from a distance look like flamingos but when you look through the binoculars you can see they are not. ﻿ Around 2:45 PM we reached the NASA Railroad Bridge which is normally open, however, today there was a huge barge blocking the channel. 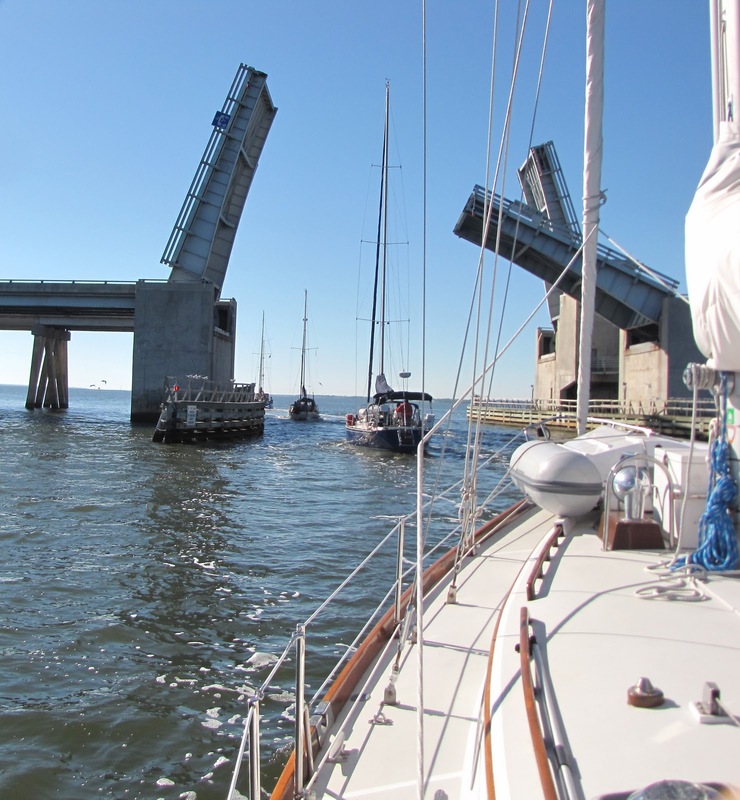 After numerous calls to the bridge from numerous boats we found out that they are working on the bridge and that it would be closed until 4:30pm! No announcements by the coast guard or any other warnings on the radio which seemed a bit ridiculous. They only open at 12:30pm and 4:30pm. So by the time the bridge opened there were at least a dozen boats, anchored and ready for the signal that we could pass. We finally got through and went into Titusville Municipal Marina for fuel and then anchored outside of the marina with numerous other boats. ﻿ We arrived at Cocoa after a decent sail where we anchored and had lunch. We then took the dinghy to the town dock where Al headed to the famous SF Travis hardware store. The largest old fashion, have everything hardware store. I of course headed to the boutique shops in town for browsing. After we got our fill of “eye candy,” hardware for Al and clothes for me, we headed back to the boat for a quiet night on the hook. We decided to stay another day because it is a great place to ride bikes. We took the bikes in the dinghy to town. We then biked several miles south along the wonderfully scenic River Drive. We stopped for lunch in town because I was craving pizza and found a great place with outdoor seating. After lunch, we biked several miles north on the River Road which was just as pretty as the south section. The weather was just perfect for biking with sunny skies and temps in the high seventies. Back on board Blue Heaven, we did a few chores and waited for our sailing association friends, Toni and Dave Mershon on Sequence to finally catch up with us. And catch up we did, on our past month of sailing experiences we each had over a drink and some munchies. It was good to see two familiar faces!